Max Allan Collins's The History of Mystery is one of the books I own related to my interest in mysteries. Early in the book he describes origins of the genre including real-life detection. 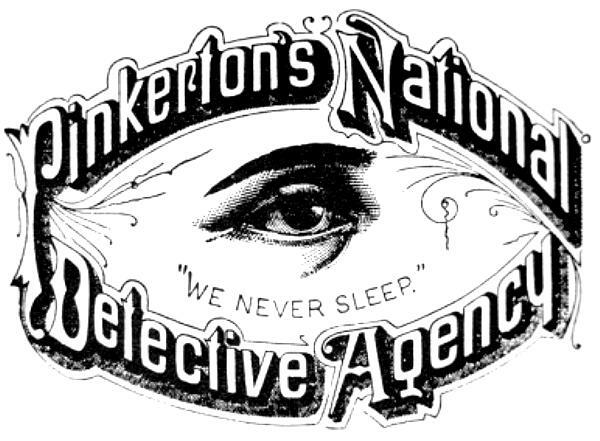 One of the subjects is the Pinkerton Detective Agency, one of the first detective organizations and the source of "private eye" (see above). The Pinkerton's became notorious as a result of employment in breaking strikes including their role in infiltrating and breaking the Molly McGuires and, later, the Homestead Strike. Dashiell Hammett, author of The Maltese Falcon had been a Pinkerton operative and his Continental Op stories were based on that experience. .... In a time when literacy was rare, Pinkerton's operatives had to maintain case journals and documentation that became permanent records at the agency. The "Pinks" even created the first rogues' gallery or photographic archive of criminals. They also worked freely in the shadowy domain between the law and the underworld, developing a large network of criminal informants. The result was a skilled agency that delivered when local law enforcement failed. Coverage by The Police Gazette, a national monthly magazine founded in 1845 and dedicated to covering crime stories, fueled the Pinkerton Agency's growth and fame. The exploits of Pinkerton agents frequently made the Gazette, and an even bigger boost came from Pinkerton's abolitionist efforts. The late 1850s was a period of political strife, centering on the issue of slavery, and Illinois was a hotbed of that controversy. The state was torn apart, the northern portion strongly abolitionist, while slaves were kept in many farms in Southern Illinois. Pinkerton's abolitionist activities brought him into contact with supporters of Illinois lawyer Abraham Lincoln. After President Lincoln's election, Pinkerton was hired to prevent possible attempts on the President's life. Pinkerton and his men went undercover in Maryland, then a swing state on the slavery issue. On the way to Lincoln's inaugural, Pinkerton and his operatives uncovered a plot to kill the President. Pinkerton's men spirited Lincoln out of the city before the plot could succeed. After the start of the Civil War, the U.S. government contracted with Pinkerton to organize the Secret Service. Pinkerton's assigned goals were to gather intelligence regarding Confederate war efforts and to ferret out Confederate spies, particularly in Washington, D.C. When the Pinkerton Agency's war exploits made a splash in the press—sparking controversies about the Lincoln assassination attempt in Baltimore, among other issues—Pinkerton published the first short pamphlets on his agency's work.